Tag line: "Return To A Galaxy... Far, Far Away"
Like millions of kids who grew up in the ‘70s and ‘80s, my friends and I were avid Star Wars fans. 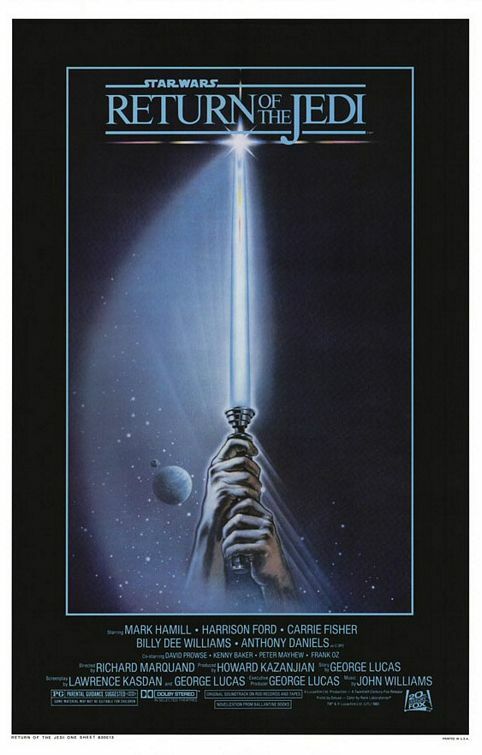 So, the release of Return of the Jedi in the summer of 1983 was a big event for us. The final chapter in the Star Wars saga, Return of the Jedi was the movie that promised to answer all our questions: Who was Luke’s father? What happened to Han? Would Luke finally become a full-fledged Jedi? So, when the big moment finally arrived, and the Star Wars logo flashed on that screen, we could hardly contain our glee. Surely, this was going to be one of the defining moments of our young lives. When it was over, as we were waiting for our parents to pick us up, my friends were singing the film’s praises, calling it the best Star Wars movie ever. I only wished I could share their enthusiasm. I definitely liked Return of the Jedi, and there were parts of it I loved. But there was something about it that didn’t work for me, and, as it turns out, a good many fans felt the same way. It was the Ewoks. After the dark drama that closed out The Empire Strikes Back, those cuddly little rodents felt out of place. It was kinda like following up 1976’s Grizzly with a viewing of The Care Bears Movie. After rescuing Han Solo (Harrison Ford) from the clutches of Jabba the Hut, Luke Skywalker (Mark Hamill), Princess Leia (Carrie Fisher) and Lando Calrissian (Billy Dee Williams) re-join the rebel army, which is about to launch an all-out assault on the Empire’s brand new Death Star station. On the forest moon of Endor, Han and Leia, with the help of an indigenous species known as the Ewoks, attempt to disable the station’s shield generator, while Luke, on-board the Death Star itself, is locked in a battle of wills with the Emperor (Ian McDiarmid) as he tries to convince his father, Darth Vader (David Prowse, with the voice of James Earl Jones), to turn away from the Dark Side of the Force. There are plenty of great scenes in Return of the Jedi, like the entire opening sequence set on Tatooine, and the dramatic showdown between Luke and the Emperor that occurs late in the film. Also, I’d rank the final aerial assault on the Death Star as the single most exciting battle in any Star Wars picture, and would even pit it against the CGI-heavy skirmishes featured in the “New” trilogy (which included 1999’s Star Wars Episode I: The Phantom Menace, 2002’s Star Wars Episode II: Attack of the Clones, and 2005’s Star Wars Episode III: Revenge of the Sith. Take note: this is the last time you’ll hear me mention these three movies during the challenge). And then, we have the Ewoks. Following the grim conclusion of The Empire Strikes Back, I couldn’t, for the life of me, figure out why its direct sequel had to “cute” things up so much. Those of us who had been with the series since its start in 1977 were, by the time Return of the Jedi came out, a full six years older, meaning we’d relegated our stuffed animals to the scrap heap long ago. We didn’t need a pack of Teddy Bears running around with spears to keep our attention focused on the screen. What made it worse were all the sugary-sweet moments with these things, like when C-3PO (Anthony Daniels) is telling a gathering of Ewoks the story of Luke, Leia and Han’s adventures thus far, and we’re shown their faces as they “Ooh” and “Ahh” at every twist in the tale. It’s as if they were being treated like pets, which made it even harder to accept the later sequences when they were duking it out with the Empire. Perhaps it’s because I knew the Ewoks were there to pander to very young Star Wars fans (much younger than myself), or maybe it had something to do with the fact that, when we were in the theater back in ’83, one of my friends kept cooing “awww” every time the damn things did something clever. Whatever the reason, I was praying for Ewoks to be slaughtered by the dozen. In many respects, Return of the Jedi is an excellent fantasy / adventure film, and the perfect ending to what is arguably the most outstanding trilogy in the cinema’s long history. I still highly recommend it (though who I’m recommending it to, I’ve no idea. Odds are, most of you reading this have already seen it).